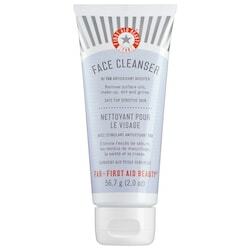 So I bought a little tube of the First Air Beauty Facial Cleanser to test it out because it looked decent, and I have pretty touchy skin sometimes. I put this in the shower since I ran out of my Purity cleanser. Normally in the shower I have to sort of rub my eyelashes with my fingers to get my mascara off. NOPE. Not this time. I did it and nothing came off. What? Did it not work at all?! I looked in the shower head to see what was going on (without my classes mind you, so I was like 2 inches from the silver trying to see my makeup’d face). And my skin was bare. No makeup, just my dark circles staring back at me. Did that actually just happen? My next shower rolls around and I do the same thing. And the exact same thing happens. It takes off my makeup and mascara without a trace, first try. But it’s weird and shiny, it can’t possibly work? OH IT DOES. It did leave my skin a little tight, and slightly dry. Like I was excited to put my moisturizer on to relive that feeling. But the removing ability of this thing was incredible.